West Bromwich Albion Football Club has pledged its support following confirmation that midfielder Gareth Barry’s 39-year-old brother died in a road traffic collision in Sussex last week. 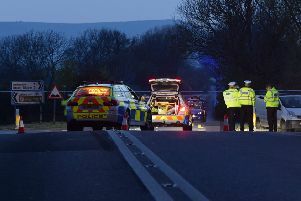 Marc Barry, 39 from Westfield, died when the white Mercedes Vito van he was travelling in collided with a black Nissan Qashqai on the A28 Brede Hill, at about 7am on Thursday, July 19, a Sussex Police spokesman said. Former Premier League star Gareth was granted compassionate leave following the incident on Thursday morning, before returning to training this week. He featured in a behind-closed-doors match against Brentford on Tuesday. Marc’s father Stan paid tribute. He said: “Marc was a very warm and sociable man, he loved spending time with his family and his friends. “He was a good, hard working man, who loved his family especially his two boys Zac and Louie who he was so proud of. He was very happy in his relationship with his girlfriend Leanne. “We are all totally devastated that our Marc has been taken away from us in the prime of his life. He leaves behind a mother, father, girlfriend, three brothers, two sisters and two sons who all loved him dearly and it is something as a family we will never get over.